Inventive lighting technologies and designs create a stunning outdoor living space. Determining the best lighting scheme for your swimming pool does much more than give you opportunities for nighttime swims and post-sunset relaxation. A well-devised plan—with the proper products, design, and landscape interface—can create a beautifully personalized, safer setting for the pool and the entire landscape. 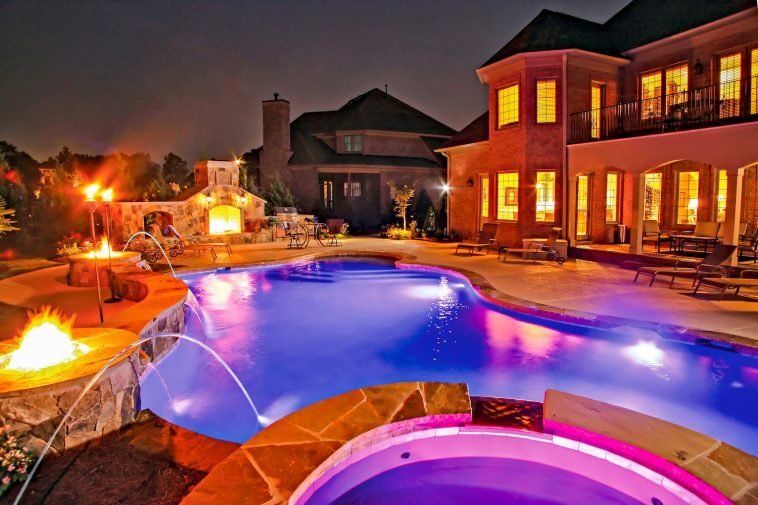 With technology that seems to advance in the blink of an eye, pool professionals are developing dramatic new options for lighting, rendering a customized pool that is beautiful and safe after the sun sinks into the west. The key, experts say, is a professional team that prioritizes planning and coordination, plus an educated consumer. Howard Roberts, owner of Liquid Inc. and Liquidscapes, says that new features in pool design are opening oceans of ways to use lighting. Roberts works in the New Jersey headquarters of his full-service company, where certified professionals produce pool design, construction, and landscaping. Roberts recently finished a project in Morristown, New Jersey, that abundantly demonstrates how lighting is tied to creative design. The home’s poolscape includes a custom-made pergola with a chandelier of overhanging lights crowning a beautiful mahogany dining table. Lighting around the roof illuminates the grill station and bar, uplighting shines on stands of trees, and ceramic balls with LED lights lead from the indoor kitchen to the outdoor grill area. Automation, LED, and fiber optics go far to make a splash with color and design or to create a theme. “Fire bowls and other fire features like pits and fireplaces, and obviously lighting throughout the landscaping in the softscape, grill stations, and so forth, are all means to the illumination options available today,” Roberts adds. Ray Thibault, director of business development for PAL Lighting USA (the North American agent for the Australian company), is thinking beyond tradition in outdoor illumination thanks to new advances in LED lighting. PAL Lighting introduced the world’s first LED perimeter lighting that is UL listed for pool and spa: the PAL LED Optics Lighting system. The application might be standard lighting around the pool or just above the water level, reflective lighting around columns with fire bowls, illuminated stepping stone paths to the pool, or indirect lighting reflecting off the pool. Diffused lighting, he adds, is beautiful around the back sides of benches or under counters in an outdoor kitchen. Currently Thibault is following an innovation now in the beta stage: submerged alcoves in swimming pools. Lazlo also points out that the technology’s dynamic light shows are a spectacular visual treat for entertaining. These sophisticated displays provide hundreds of dancing colors, and pool owners can use them to set a backyard mood or theme. “For example, you can pick a light show program with slowly changing blue and white lights for relaxation, or choose one with rapidly moving jewel-like colors for a festive poolside party,” she explains. Michael Joye founded Auroralight in Carlsbad, California, more than 20 years ago with the goal of building lighting products that last a lifetime while enveloping the spirit of fine craftsmanship. Joye, one of the company’s creative minds and its president, highlights two Auroralight projects, one by award-winning lighting designer Ron Neal. “These days we only specify LED in our landscape designs, and we use Auroralight on every single project nationwide,” Neal says. Both properties have various elevations and separate areas for a swimming pool, fire pit, and pergola. Each links beautifully with its homeowners’ goals of making the most use of outdoor space, whatever the time of day. Auroralight also provided the fixtures for a project by McKay Landscape Lighting, a complete outdoor lighting company. The vacation home, a former estate on a secluded private lake, is the culmination of a three-year property overhaul with updated glass tile and decking for the pool. The new lighting scheme—the final artistic flourish—includes down lighting from trees shining on the patio, pool deck, sculpture, and stone steps. The steps themselves, which thread toward the pool area and walkways, are illuminated by additional path lights.